A spring is an elastic object used to store mechanical energy. Springs are usually made out of hardened steel. Small springs can be wound from pre-hardened stock, while larger ones are made from annealed steel and hardened after fabrication. Some non-ferrous metals are also used including phosphor bronze and titanium for parts requiring corrosion resistance and beryllium copper for springs carrying electrical current (because of its low electrical resistance). The rate of a spring is the change in the force it exerts, divided by the change in deflection of the spring. That is, it is the gradient of the force versus deflection curve. An extension or compression spring has units of force divided by distance, for example lbf/in or N/m. Torsion springs have units of force multiplied by distance divided by angle, such as N·m/rad or ft·lbf/degree. The inverse of spring rate is compliance, that is if a spring has a rate of 10 N/mm, it has a compliance of 0.1 mm/N. The stiffness (or rate) of springs in parallel is additive, as is the compliance of springs in series. Depending on the design and required operating environment, any material can be used to construct a spring, so long the material has the required combination of rigidity and elasticity: technically, a wooden bow is a form of spring. 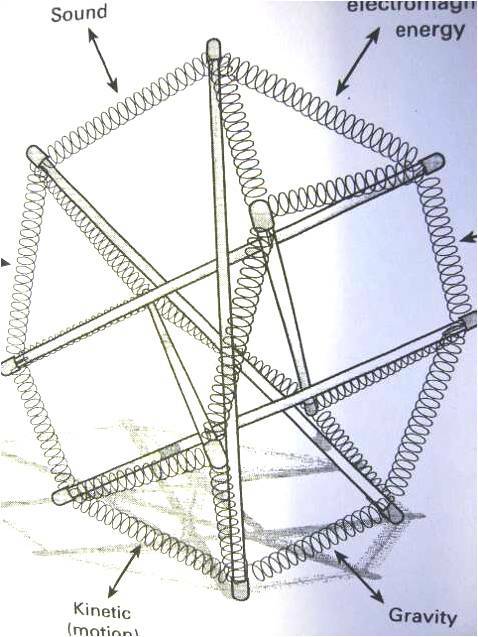 Many tensegrity explorers use springs as tension elements. 6 strut tensegrity with springs as tension members. Attribution unknown, from Energy Medicine Powerpoint compiled by B. Lowry"